A simple spray and rinse application saves time, and results in a durable silica shell that produces a brilliant protected shine that is incredibly easy to maintain. Our 'Hydroelectric bonding' function means HydrO2 reacts chemically with water contact! This means the coating transforms from Hydrophilic to Hydrophobic. The pressure from spraying with water accelerates the bonding of HydrO2 to the surface creating a Hydrophobic layer. HydrO2 is climate and temperature stable, and is an extremely effective long lasting water repellent that is resistant to nearly all acids, alkaline solutions, and solvents while offering significant UV (Ultra Violet) protection. HydrO2 is sold only in concentrated form which offers significant cost savings as well. 1. Do NOT apply HydrO2 in the sun or to a hot surface! Applying in this manner will cause streaks that may not wipe off easily. 3. Surface must be well cleaned from soap residue and left wet wth water. 4. Dilute 1 part HydrO2 to 3 parts water. We recommend a spray bottle for fast and easy application. 5. Spray fine mist of diluted HydrO2 on no more than 1/4 of vehicle before rinsing. Very little is needed and no overlap is needed. 6. From time you start spraying a section to rinsing off should be NO more than one minute max in optimum conditions. 7. Immediately rinse well with strong water pressure to produce physical shock and create a well formed coating. 8. Repeat steps 5-7 on the next section of the vehicle rinsing well before moving to next section. 9. Finish by 'flood rinsing' the vehicle without a spray nozzle to push all the water off from top down. 10.Dry any remaining water by blowing off or with a clean microfiber waffle weave towel. HYDRO2: TOUCHLESS SEALANT ' CONCENTRATE (50ML) Save Time and Money and Get Protection for your Car Introducing the incredibly easy to use, effective, and revolutionary TRUE WIPE-LESS spray sealant! 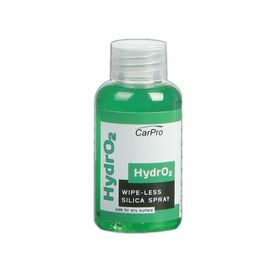 CarPro HydrO2 is formulated with Hydrophilic glass fibers, silicon polymers, and fluoropolymers and can be applied to all vehicle surfaces! Paint, glass, plastic, convertible tops, wheels, calipers, and wheel wells are all easily within reach with HydrO2. HydrO2 was specifically formulated to save time and therefore money for all the Car Pros and enthusiasts alike! This new innovative coat forms an ultra-water-repellent coating and is applied by simply spraying and then rinsing off with only water! A simple spray and rinse application saves time, and results in a durable silica shell that produces a brilliant protected shine that is incredibly easy to maintain. Our 'Hydroelectric bonding' function means HydrO2 reacts chemically with water contact! This means the coating transforms from Hydrophilic to Hydrophobic. The pressure from spraying with water accelerates the bonding of HydrO2 to the surface creating a Hydrophobic layer. HydrO2 is climate and temperature stable, and is an extremely effective long lasting water repellent that is resistant to nearly all acids, alkaline solutions, and solvents while offering significant UV (Ultra Violet) protection. HydrO2 is sold only in concentrated form which offers significant cost savings as well. Features: Value: Only 40ml needed per average 4 door vehicle including all paint, glass, trim & wheels Protect Everything: Apply to areas you never could before! Not only body panels but protects calipers, undercarriage, wheel wells, door jambs, in between seals and more Versatility: Use on any surface Ease of Use: Spray on and rinse off Dirt and Water repellency: Dirt and water are repelled from the surface Instant Vehicle Release: No cure time needed Time Saver: Maintains paint quickly with enormous time savings compared to any other paint protection product Less wiping: With no more wiping and buffing waxes or sealants on and off the paint there is less chance of scratches. UV Protection: Offers significant protection from UVA and UVB rays and sun damage Chemical and fallout Protection: Resistant to nearly all acids, alkaline solutions, and solvents Concentrated Value: For every ounce/ml of HydrO2 you make 4 oz/ml ready to use spray. Dilution of 1 part Hydro to 3 parts water (25% HydrO2 + 75% water) Beauty: Instantly revives the high gloss, deep luster, and smoothness of your paint Durability: 3 to 6 months DIRECTIONS: 1. Do NOT apply HydrO2 in the sun or to a hot surface! Applying in this manner will cause streaks that may not wipe off easily.2. In shaded location or shop wash your vehicle and remove any dirt from the surfaces. (Use our CarPro Snow Soap for best results.)3. Surface must be well cleaned from soap residue and left wet wth water.4. Dilute 1 part HydrO2 to 3 parts water. We recommend a spray bottle for fast and easy application.5. Spray fine mist of diluted HydrO2 on no more than 1/4 of vehicle before rinsing. Very little is needed and no overlap is needed.6. From time you start spraying a section to rinsing off should be NO more than one minute max in optimum conditions.7. Immediately rinse well with strong water pressure to produce physical shock and create a well formed coating.8. Repeat steps 5-7 on the next section of the vehicle rinsing well before moving to next section.9. Finish by 'flood rinsing' the vehicle without a spray nozzle to push all the water off from top down.10.Dry any remaining water by blowing off or with a clean microfiber waffle weave towel.